Any yacht owner will know that the many joys of yacht ownership have their downside in the costs of berthing, maintenance and insurance, and the worry of ensuring that any work is completed promptly and efficiently by trustworthy technicians and engineers. For those owners who live some distance from the marina, an additional concern is to ensure that their yacht is safe and secure at all times. 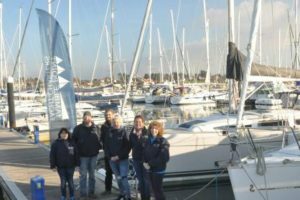 Hamble Point Yacht Charters offers three competitive options for the care and day-to-day management of your yacht, providing you with peace of mind, removing the stress from yacht ownership and freeing you to enjoy your sailing. It is also possible to offset the cost of yacht ownership through yacht charter income. Yacht Guardianage helps you to enjoy stress-free yacht ownership, knowing that someone is constantly keeping a professional eye on your yacht with daily and weekly checks. Hamble Point Yacht Charters will thoroughly clean your yacht inside and out every fortnight, ensuring she is ready to sail as soon as you are. Your yacht is not used for charter. What is Yacht Charter Management? – with subscription Yacht Charter Management, you pay a low monthly fee leaving us to pay all the maintenance bills and running costs for your yacht from any charter income – we even take the hit on any surprise bills. In either case, we will manage the marketing and the administration of the charter enquiries and bookings. Your yacht is still available for you to use, whenever she is not on charter. So you get the maximum benefit from your ownership, whilst ensuring that your yacht makes a significant contribution to paying her own way when you are not using her. For more details including a worked example of finances, download and view our Yacht Management factsheet. Why choose Hamble Point Yacht Charters? We have been based at Hamble Point Marina since 1993. During this time, as a family-run business, we have concentrated on offering a highly personal service to both the owners of the yachts on our fleet and to charterers. The majority of our charters are repeat bookings and much of our business is through personal recommendation. We have a reputation for a high quality of maintenance and presentation of our fleet, at the top end of the charter market. Our charterers tend to be individuals, families, sailing clubs and retired persons. We aim for a friendly yet professional approach and are members of the Royal Yachting Association, British Marine Federation and Professional Charter Association. Our location at Hamble Point Marina is easy to get to and provides prime access into the Solent. We will always be pleased to help with any queries that you may have concerning your yacht, equipment or sailing generally, and access to our 24 hour emergency hotline is available to you whenever you are sailing.